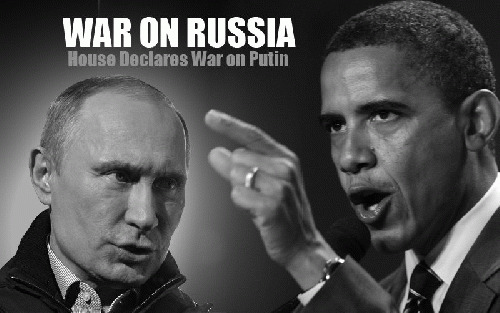 The United States does not want a war with Russia, it simply feels that it has no choice. If the State Department hadn't initiated a coup in Ukraine to topple the elected president, Viktor Yanukovych, then the US could not have inserted itself between Russia and the EU, thus, disrupting vital trade routes which were strengthening nations on both continents. The economic integration of Asia and Europe -- including plans for high-speed rail from China ("The New Silk Road") to the EU -- poses a clear and present danger for the US whose share of global GDP continues to shrink and whose significance in the world economy continues to decline. For the United States to ignore this new rival (EU-Russia) would be the equivalent of throwing in the towel and accepting a future in which the US would face a gradual but persistent erosion of its power and influence in world affairs. No one in Washington is prepared to let that happen, which is why the US launched its proxy-war in Ukraine. "US, Bulgaria to hold Balkans military drills," "NATO Begins Exercises In Black Sea," "Army to send even more troops, tanks to Europe," "Poland requests greater US military presence," "U.S. Army sending armored convoy 1,100 miles through Europe," "Over 120 US tanks, armored vehicles arrive in Latvia," "US, Poland to Conduct Missile Exercise in March -- Pentagon." Get the picture? There's a war going on, a war between the United States and Russia. Notice how most of the headlines emphasize US involvement, not NATO. In other words, the provocations against Russia originate from Washington not Europe. This is an important point. The EU has supported US-led economic sanctions, but it's not nearly as supportive of the military build up along the perimeter. That's Washington's idea and the cost is borne by the US alone. Naturally, moving tanks, armored vehicles and artillery around the world is an expensive project, but the US is more than willing to make the sacrifice if it helps to achieve its objectives. And what are Washington's objectives? Bingo. Ukraine has nothing to do with sovereignty, democracy or (alleged) Russian aggression. That's all propaganda. It's about power. It's about imperial expansion. It's about spheres of influence. It's about staving off irreversible economic decline. It's all part of the smash-mouth, scorched earth, take-no-prisoners geopolitical world in which we live, not the fake Disneyworld created by the western media. The US State Department and CIA toppled the elected-government in Ukraine and ordered the new junta regime to launch a desperate war of annihilation against its own people in the East, because, well, because they felt they had no other option. Had Putin's ambitious plan to create a free trade zone between Lisbon to Vladivostok gone forward, then where would that leave the United States? Out in the cold, that's where. The US would become an isolated island of dwindling significance whose massive account deficits and ballooning national debt would pave the way for years of brutal restructuring, declining standards of living, runaway inflation and burgeoning social unrest. Does anyone really believe that Washington would let that happen when it has a "brand-spanking" trillion dollar war machine at its disposal?